No more "high ping detected" type of messages. Some other things have been implemented for this, and some other more sophisticated things is also very high up on the todo list at the moment. You have aircontrol while using W and having less than 100 speed. Run lengths in the stats were bugged as it was, they have set to 0 for existing records. For new records they should make sense now. Run related sounds should also work when you're spectating someone now. That enumprocesses bug should also be fixed in this release. SDL was also updated to the newest 1.x release, let me know if anyone has any issues with input or alike they didn't have before. Update to SDL 2.x is on the todo list but I haven't bothered with it yet. RIKmap was updated with some better quickcompile support. Some vote bugs have been fixed, most notably the random vote and the server autovote should be fixed now. I'll expand further on the random command in the near future, so you can simply get a random selection of maps to chose from, or a random "easy" map for example. Not allowed to set records with noobmode. (Fixed bug where you could turn it off before the end trigger and still set a time). Chat color changed to be more visible in the console. The installer will always install the newest files. You can launch the game from the play page to connect to online servers. When you do that it will check for updates to the game automatically before actually connecting. Please post any bugs and issues you encounter here at the forums for the time being! 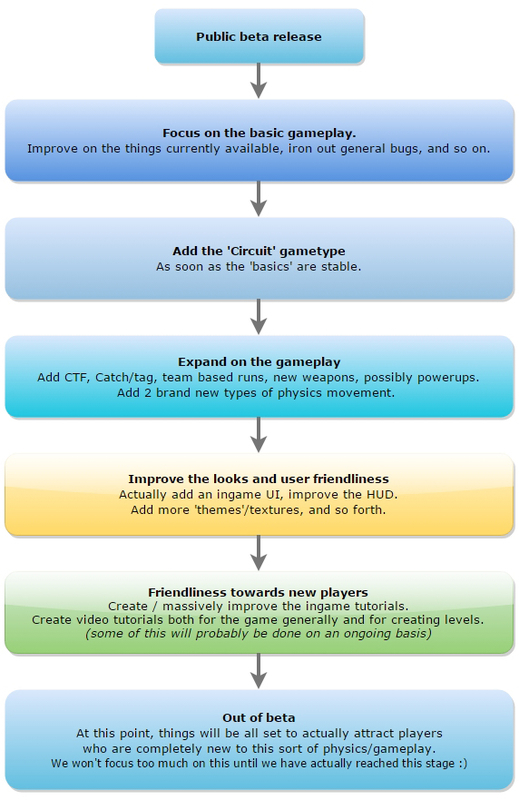 Below is a rough layout of our plans for the future. One important thing to be aware of with the current release, is that there is no UI, you'll need to use the console. Side note: You can press N ingame to enable "noobmode". This accelerates automatically while holding W. Will give people not experienced with strafing a chance to test it a bit "better" as well.